Italian painter Caravaggio's dramatic and realistic style spread across much of Europe in the 1600s. Caravaggisti painter Bartolomeo Cavarozzi's "Virgin and Child With Angels". Caravaggisti art refers to an artistic movement that resulted in a new Baroque painting style. It is characterized by the use of tenebrism and chiaroscuro. Tenebrism is the use of profound shadowing and high contrast between areas of light and dark. This technique leaves many areas of the painting completely black in order to highlight the subject. Chiaroscuro is also the shadow of light and shadows to create a three-dimensional appearance. Caravaggisti art became popular during the late 16th Century due to the work of Michelangelo Merisi da Caravaggio, an Italian Mannerist painter after whom it was named. Mannerism is an art form that exaggerates balance and ideas of beauty. Caravaggio was known for his religious paintings and still lifes. Despite having never opened an art studio to teach his techniques and having actually discouraged other artists from copying his style, the work of Caravaggio became one of the most influential art movements of the time. His techniques were followed by many Italian, as well as other European, artists, both during his life and after his death. These followers were referred to as Caravaggisti. Some of these individuals spent their entire lives modeling their work after the Caravaggio style and others used his style for a short phase in their careers. Although he began his work in Rome, Caravaggio went to Naples in May of 1606, where several other artists began following his techniques. Unfortunately for Caravaggisti art, the outbreak of the plague in 1656 interrupted its popularity. French, Dutch, Flemish, and Spanish artists were also influenced by the techniques of shadowing and high contrast during their time in Italy. They returned to their home countries, taking with them the Caravaggisti art style. Some of the most well known Roman Caravaggisti artists included Orazio Gentileschi, Bartolomeo Cavarozzi, and Giovanni Baglione. 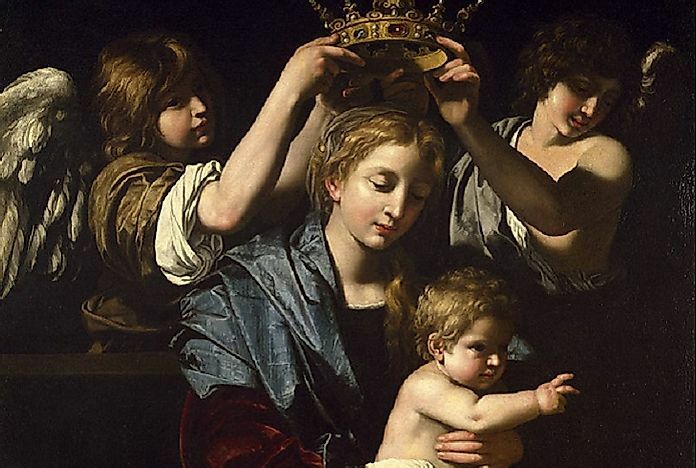 Orazio Gentileschi went on to become a painter for King Charles I of England. One of his most well-known works is Madonna with Child, which shows the Virgin Mary with a halo of light around her head and holding the baby Jesus. The background is much darker than the foreground. Bartolomeo Cavarozzi is known for several works. Perhaps the most recognized of these is St. Catherine of Alexandria, which shows St. Catherine in a darkened room with a small stream of light entering through a high window. Giovanni Baglione painted some Caravaggisti art for a brief period in his career. One of the best examples of this is his Apollon, a painting of Apollo against a black background. As previously mentioned, several Dutch, Flemish, and Spanish artists came to Italy during the early 17th Century and learned the Caravaggisti technique. The introduction of Caravaggisti art in these countries led to the development of new painting styles in Flemish, Spanish, and Dutch Baroque art. This Baroque art combined Caravaggio’s realism with religious subjects, a style that became popular as protest against the religious reformation of the period. After Caravaggio’s death in 1610, his technique only remained popular for another decade. Around 1620, the popularity of Caravaggisti art began to decline in Rome. In some areas of the Netherlands and France, the influence of Caravaggisti art persisted into the middle of the century. The influence of Caravaggio remains important to this day. The Caravaggisti art movement was responsible for renewing Italian art by giving it a more three-dimensional presentation. It is often credited with promoting dramatic imagery which allowed artists to express depth and character.